We’d love your help. Let us know what’s wrong with this preview of Dangerous Prayers by Francesca Resta. World-changers. Rebels. Rejecters of the status quo. Throughout history, Christians were never meant to have a safe faith. Learn from the brave ones who have gone before you with Dangerous Prayers, an inspiring collection of prayers from people who have changed the world. Exploring historical figures, cultural icons, political leaders, saints, and martyrs, this book offers World-changers. Rebels. Rejecters of the status quo. Throughout history, Christians were never meant to have a safe faith. Learn from the brave ones who have gone before you with Dangerous Prayers, an inspiring collection of prayers from people who have changed the world. Exploring historical figures, cultural icons, political leaders, saints, and martyrs, this book offers you a rich visual experience to explore the power of dynamic prayers. From St. Francis of Assisi to Harriett Tubman to Billy Graham, God can use ordinary people who pray courageous prayers to do extraordinary things for Him. No matter your age, position, or status, praying dangerous prayers will change your life—and likely the world around you as well. To ask other readers questions about Dangerous Prayers, please sign up. I love history and I love reading about those who came before us in the faith. Reading bits and pieces about these people is always encouraging because you see so clearly how God works. I love the idea behind this book. Sharing the dangerous prayers of those who have changed the world is inspiring in so many ways. There is one thing I need to say though. As you know, if you’ve been around the blog for a minute or two, race and America are important topics to me. We can’t heal if we don’t acknowle I love history and I love reading about those who came before us in the faith. Reading bits and pieces about these people is always encouraging because you see so clearly how God works. I love the idea behind this book. Sharing the dangerous prayers of those who have changed the world is inspiring in so many ways. There is one thing I need to say though. As you know, if you’ve been around the blog for a minute or two, race and America are important topics to me. We can’t heal if we don’t acknowledge the sins of those before us, so I must ask, why do we keep including certain people in our heroes of faith? Two examples in this book are George Whitefield and Jonathan Edwards. Whitefield was pro slavery. He actively taught that slavery was good and justified it. He believed Africans and African Americans were subordinate. Edwards himself owned slaves. As Christians, we need to stop praising people who played a hand in keeping one of America’s darkest sins alive and running. I don’t expect our past leaders to have been perfect, but they never realized their sin nor repented. The church then and now is made up of millions of people they helped to keep enslaved. The ripples of their actions continue today. I’m also not saying we remove them from our church history – all the more reason to actually keep them, as it shows how racism was in the church for centuries – but we also don’t need to include them in every hall of faith type of book Christians publish. We can only move forward when we acknowledge the past. Dangerous Prayers - 50 Powerful Prayers That Changed the World is compiled by Susan Hill and the portrait illustrations are by Francesca Resta. Additional illustrations are by Isabella Grott and Julianne St. Clair, and it is published by Thomas Nelson. Dangerous Prayers is a beautiful book that shares 50 prayers and information about Christians throughout history. 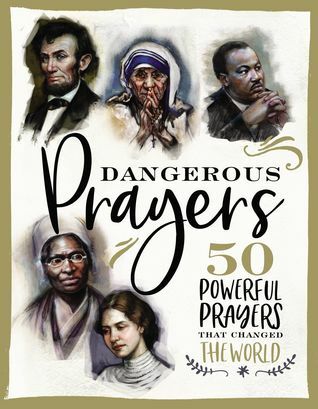 It shares their birth year and death year (if applicable), two pages for what they were known for, and a personal prayer from that per Dangerous Prayers - 50 Powerful Prayers That Changed the World is compiled by Susan Hill and the portrait illustrations are by Francesca Resta. Additional illustrations are by Isabella Grott and Julianne St. Clair, and it is published by Thomas Nelson. Dangerous Prayers is a beautiful book that shares 50 prayers and information about Christians throughout history. It shares their birth year and death year (if applicable), two pages for what they were known for, and a personal prayer from that person. The people range from historical figures, cultural icons, political leaders, to saints and martyrs. Some of the people are Billy Graham, Martin Luther King, Jr., Abraham Lincoln, Corrie ten Boom, George Washington Carver, Helen Keller, and C.S. Lewis just to name a few. The illustrations and portraits in this book are gorgeous. I like that there is a brief introduction to who these historical figures were and how they changed history. There are inspiring quotes, as well as their prayers to help encourage each of us in our faith. Many of these people, I did not know were Christians. It would be an excellent resource book if you have a child or student who is looking for information on historical figures or a start for a biography. My sons and I enjoyed reading this together, learning about a different person each night before bed. I think this book can be enjoyed by everyone. It is a beautiful glimpse into different parts of history, and how the brave prayers of these amazing people can inspire each of us today. I received a complimentary copy of Dangerous Prayers from BookLook Bloggers, in exchange for a honest review. Dangerous Prayers: 50 Powerful Prayers That Changed the World is a simple read for both adults and older children. It goes into a brief bio for each person and ends with a prayer from them. I like and dislike how short the bios are. They give you enough information that you get the gist but not enough to really sink into the person's life. It does help you not get bored, which would be good for younger readers. I also enjoyed the variety of people they chose. Here are a few that were in the book Dangerous Prayers: 50 Powerful Prayers That Changed the World is a simple read for both adults and older children. It goes into a brief bio for each person and ends with a prayer from them. I like and dislike how short the bios are. They give you enough information that you get the gist but not enough to really sink into the person's life. It does help you not get bored, which would be good for younger readers. I also enjoyed the variety of people they chose. Here are a few that were in the book: Billy Graham, E.M Bounds, Lottie Moon, Helen Keller, Dietrich Bonhoeffer, to name a few! I did think having Jesus be one of the biographies was a bit silly. As for the prayers, some were very powerful, and some were not so much a prayer but maybe a hymn or something they wrote on prayer. Overall that part was ok. I did think the illustrator Francesca Resta did a lovely job. This book is an absolutely amazing book to have in ones collection, not only because it is such a fascinating read but the illustrations are also stunning, I really think they are frame worthy! This book combines the very well know like Abraham Lincoln, Martin Luther King Jr. and the more obscure like Dora Yu, Jarena Lee, etc but all have been carefully chosen for the rich impact they have made in the world for their devotion to God and doing His will. One of my favorite things about this book is This book is an absolutely amazing book to have in ones collection, not only because it is such a fascinating read but the illustrations are also stunning, I really think they are frame worthy! One of my favorite things about this book is how their is a quote from each of the people included, they were so thought provoking. This book is such an easy read, but packed with so much insight that it is absolutely perfect. This is a great read for old and young alike. Lots of faith based reading in this book which also includes famous people. While we will never be sure how many other prayers did not make it in the book, I was happy to read the ones that did and think that this would make a really nice read on off time or during a time when you need reflection. I loved this book. It has a short bio on each person then goes on to a prayer/hymn. The pictures are absolutely stunning. I also love reading about different Christians that I have never heard about. This book is a fast read so I see myself reading it again. Dangerous Prayers: 50 Powerful Prayers That Changed the World by Francesca Resta is an eye-opening look into some of the boldest prayers in history. More than a collection of prayers it is a tribute to men and women who influenced history. With each prayer, you get a 1-2 page biography of the person, a portrait of the person, and the prayer the person wrote and prayed. Dangerous Prayers makes for an interesting read! Francesca is an Italian freelance illustrator that lives in a miniature flat in London. She is a fantasy and sci-fi reader and her love for illustration started with her love for books. Since her early teens, she is interested in book covers and she used to challenge herself to recognize the artist of those same covers. She studied art and illustration wherever she could, from private painting less Francesca is an Italian freelance illustrator that lives in a miniature flat in London. She is a fantasy and sci-fi reader and her love for illustration started with her love for books. Since her early teens, she is interested in book covers and she used to challenge herself to recognize the artist of those same covers. She studied art and illustration wherever she could, from private painting lessons to more organized schools, to intensive workshops held by some of her artistic heroes. And from a lot of self-taught practice.